Are you busy? Do you need audio resources to help you prepare for PHR and SPHR concepts without having to take time to read and review half a dozen textbooks? This is the resource for you. One of the most common questions I get from people interested in certification is where to find something they can listen to in the car, on a walk, or even at work. I’ve mentioned before that as busy as I am with kids and work, I really like to listen to podcasts and other audio programs while I’m washing dishes or chaperoning people around town. 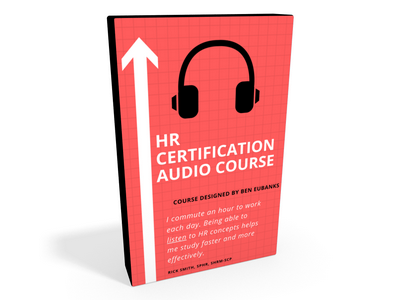 Today, I’m excited to announce the presale for the new HR certification audio series. Until now there has only been a minimal selection in the market for audio prep tools, and they are all fairly pricey. I wanted to develop something that would help to improve the HR certification prep experience while still meeting that need for auditory learners. We are launching this in time for people to use it for 2017 exam preparation. THE DETAILS This program is in presale and officially opens up later this spring. I have been developing it since late 2016 and expect the first version to be available by the end of February. Presale supporters will be the first to gain access to the audio course when it opens. The course will have lessons spanning all areas of HR to help students better understand best practices and have the most up-to-date knowledge of how to leverage those practices for business success. In addition, these courses can be used for recertification credits! If you’re currently certified and want to use the content in these courses for recertification purposes, you can manually add them to your profile to get credit. Is this just for the PHR or SPHR? No. I’ve had dozens of students use our other courses to study for the SHRM-CP and SHRM-SCP exams. I’ve also had some even use it for the aPHR exam with excellent results. The principles explored in this audio study course will be applicable across the spectrum of HR. If you like the kind of work I do here at upstartHR (including the podcast) or if you’re interesting in improving your HR game, this will help you. What is included? The course will initially include audio lessons totaling more than 3 hours of content. This will grow to 5+ hours by June and could eventually reach 10+ hours of training by 2018, depending on the level of interest in the course. It’s my goal for learners to be able to use these audio lessons for reinforcing concepts, examining practical applications, and exploring case studies of HR in action. What is the format? The presale will include mp3 audio files so learners can learn anywhere. Users can stream the files directly from the web or can download the audio pack to their computer or mobile device via Dropbox. The mp3 files will include lifetime access in the event you need to put off your studies, come back later to refresh, or just want to use them for recertification credits after you pass your exam. What is the price? The price is $67 standalone or $147 bundled with the SPHR self study course. If you have questions, please contact me at ben@upstarthr.com and I’ll be glad to answer them. I’m excited about the next evolution of certification preparation support here at upstartHR, where we’ve been helping hundreds of HR professionals like you with certification for more than eight years.